She's definitely not for the faint of heart. If Boadicea the warrior queen was still alive it would take someone like her to impress this headstrong mare. Make no mistake while she respects power you'll have to show her power AND some form of code in order to impress her. She came from the wilds believing all bonded were nothing but slaves. A white blaze adorns her dark red muzzle. Her wings are patterned like a redtailed hawk's and her bold proud gaze surveys all the land as if to be conquered. She even dwarfs her large brothers by a full hand. She prefers her mane in rows of braids so less someone she does not deem worthy can grab ahold and try mounting. The bold red predominates on the mix of aqua, red, and indigo. Appearance: You know that tendency that Nightwaves have to being darker colors? Well, apparently this magnificent steed missed that memo. Well, mostly. 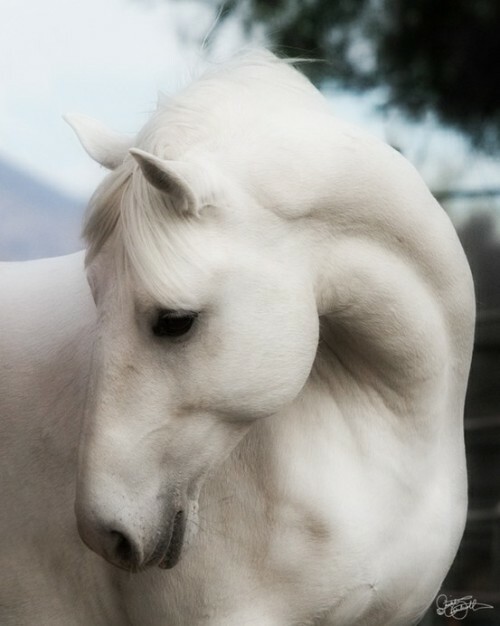 His hide and mane are both nearly pure white, with only the faintest shading of grey, heaviest on his soft lips. Lean muscles flow beneath this nearly pure hide, making him faster than he is strong, but still a formidable equine in every right. He’s rather large, but not unmanageably so. And oh, about the whole dark thing? 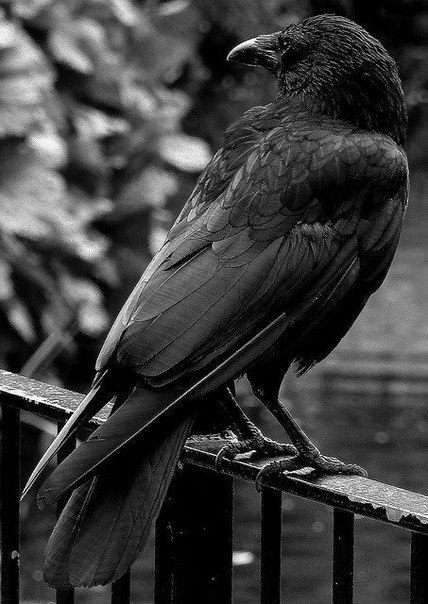 Maybe his genetics thought they’d make up for it by giving him pitch black wings, dark as a raven with just the right amount of navy sheen in the sunlight. And hey, those pretty wings match his dark, soulful eyes. Is it just me, or does he seem pretty smart for a Pegasus? Or maybe it’s just that curiosity coming through. Personality: He seems like he cares. And really, maybe he does, but it’s so hard to say. He won’t come running to the rescue just because you need it. He’s very helpful, but only when it strikes him as interesting. Going somewhere new? Oh, he’ll definitely take you there. He wants to see it, too. Need to move some lumber? Well, that would depend on what you’re planning on building with that. Really, he’s reliable enough, but just when you need him most he might very well be nowhere to be seen. This Nightwave has a curious mind, and while he may not be the brightest shiny in the whole of Planet, he definitely has a knack for putting his nose wherever he wants it. At least he’s never truly unkind. Maybe if you beg, or coax, or convince him that it’s worth his while, he’ll do whatever it is you need. Otherwise, just be glad that he’s not in your pretty Vulcan hair, causing mayhem. He’s placid enough, which is good, because I’d hate to see him put one of those hooves through a wall. The Speed of Light foal… really ought to be bigger than he is. Actually, for those who aren’t familiar with Terran horse breeds, it won’t make much of a difference, but the fellow rather resembles a Fresian. He’s a beautiful boy, with a velvety black coat and a wavy mane and tail. His wings are quite the contrast, predominately a sort of medium purple in color, mixed in here and there with red. For all that it’s obvious he’ll be a dreadfully handsome stallion some day, he’s not much of a picture of elegance or grace right now. More than socializing with his siblings or playing on the obstacle course, he seems interested in examining everything. He huffs at this and sniffs at that, snuffling around the various obstacles and that rock over there, and occasionally picks his little head up to stare at a cloud passing overhead. Just because everything else is going at sonic speed doesn’t mean he has to! Though his playful will die down some as he ages and matures, this little Christmas foal will never quite outgrow his rambunctious and playful attitude. Even as he grows he never quite learns to blunt his physical affection, and T'Rae will find a horse head in her stomach just like the first time they met, and even as he gets taller and quicker he'll never stop goading her, or frankly anyone else, into chasing him. He has more energy than he knows what to do with, particularly in the winter when it's cold. After all what better way to keep warm in the colder weather than to keep moving and keep running, and in this way he certainly lives up to his Cloudfrost rank. Nothing gets this guy down, except perhaps a little hot weather. But that would get you down too if you had a coat as thick as his. And his coat is certainly thick, a warm sunshine gold that grows in long and shaggy curls, and even attempts to keep it short and managed are rather too long to put up with the summer months. 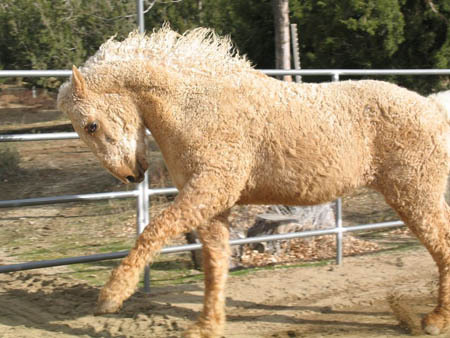 Even his mane is curly in the way it dribbles down his side in its bright cream color, the same color that brushes the bottom of his chin and makes a loop around his nose like a permanent bridle. The wings that stretch out form his body are a darker shade of burnished gold with tiny white lines across the top of them. The only cool coloring on him comes from his hooves, a bright sky blue that give off gentle pastel blues and bright whites, giving something of the appearance of snowing when he thunders through the sky. It's an effect that he rather likes to create, and it can be difficult to pull him down. And with so much cheer and good will in his olive green eyes, why would you want to? It's kind of hard to miss this lovely little mare. Small, lithe, and agile, she catches eyes even with a soft and unassuming coat of mist-grey-white. It could be the cheeky arch to her neck or the pure wit gleaming in her charming brown eyes, or it could just be that Whazzitians have a natural sense for trouble. Trouble? Nnooo. This little Moonfire is positively the picture of innocence. She's stronger than she looks, too; beneath that delicate bone structure lies a powerful and long-lasting little lady who just won't quit. Her every step of bright harvest-moon hooves is well-placed and purposeful, never mind that it might look like a silly, cheeky mare playing to her crowd! When she takes to the skies, it usually draws eyes even more than her quite pretty form — her wings are comically short and rounded, giving her little ability to fly far; but she's swift and agile in the air, and her wings are quite beautiful! 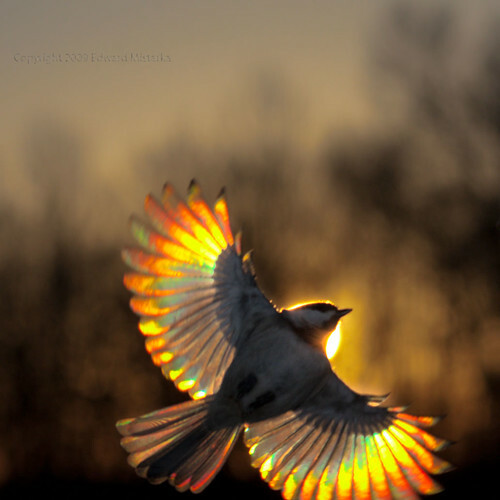 Dove grey and white like the rest of her form, they suddenly erupt into the vivid flare of a sunset's dying beams along the shafts of each of her flight feathers, the bright gold making it almost to the tips before fading once more. Don't trust this little mare around anything that could cause trouble. She is about as clever as they come, and she will definitely keep you on your toes, if you're smart enough to not be conned by an innocent pair of eyes and a sweet nuzzle or two. Of course, she is actually a sweetheart and she really doesn't mean any harm, she's just…playful. She likes to unlatch her fellows' stalls, or let loose the chickens, or encourage younger foals to make a mad dash through your house. How she manages these things isn't entirely clear, but you sure as hell wouldn't expect such a sweet, unassuming little Moonfire, right? After all, she puts on an absolutely spectacular show of being shy and curious, just the right amount of innocence and quiet charm thrown in to make it realistic. Good luck pinning her to any misdeeds, because when she pulls out her best Injured Look when you try and accuse her, it'll be impossible for the charges to stick anyways. It's not like she does any real harm, anyways, right? Heh. Tiny and dainty, it seems only natural for this Dawnblush to sport fanciful butterfly wings than the more common feathered variety. The dusty veils sprouting from her shoulders are a rather attractive mustard color, splashed with the color of adobe huts and dappled with dark chocolate, both colors of which are reflected on the rest of her hide. Her slender body is spattered in no definite pattern, and it's impossible to tell whether the brown or the clay is her base color. She has a thick, black billowing mane and tail, the same dark color and texture sought after by many a lady. 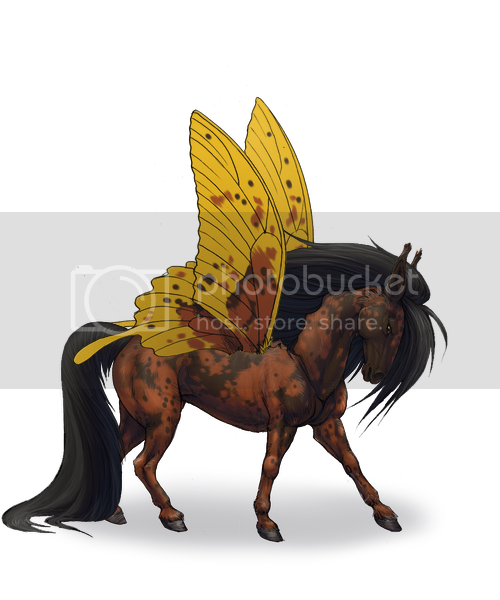 Her hooves match her wings, except with brighter colors: sunny yellow, bright orange, and deep red mixing together light the sunrise the rank is named after. There isn't much that doesn't interest Pi, from shiny pebbles to crashing waves. She enjoys seeing everything around her, and experiencing it all with her bond. She's quite precious, quietly inspecting the scenery and everything else she can get to (including each and every cupboard in your home). Even though she is almost constantly on the move, either on land or in air, she is undisruptive about it, preferring to stay quiet and avoid interrupting those around her. So while she may be extremely interested in that vase you're painting, you never have to worry about her sticking her nose past your arm and knocking the valuable object off your workspace and onto the rather destructive ground below. She's patient, and if she can't do something that she wants to, she's happy to put it on the back burner and find something else to learn about. One of the heftier Dawnblushes you'll meet, this girl is certainly not as dainty as the other females of the herd — rather, she's sturdy and stout, massive-boned and pretty large for her rank. In heft, she certainly has many beat! It may not be delicate or classically pretty, this mare's build, but it sure gets the job done. What job? Any one you ask of her! All-over a sooty black, she rarely sunburns; only the tips of her long mane and tail will shade down to rich coffee or amber, a bare concession to the strength of the jungle sun. The inky black doesn't much help to conceal just how stocky this girl is, though — on the contrast, when she comes thundering out of the paddock like a black shadow straight out of Hell, what is there to do but dive out of her path? Even if her chocolate eyes are warm and affectionate, many will fear this gentle giant, never mind that her huge black-silver wings usually jig to her own happy rhythm or her heavy dinnerplate hooves strike up happy shades of pink and gold. At least she's useful: with a Pegasus like her, you won't have to worry about having to walk anywhere! This mare is a strange dichotomy; steady as the mountains, she'll be by your side, a constant companion through thick and thin. In the same moment, however, she can be playful and impish, brash and maybe a little bit too bold — never mind that she has the bulk to back herself up! Her bold nature is belied by the subtle calm with which she carried herself in situations which require a soft touch. Sure, she might prefer to whisk you away with her ground-shaking gallop, but if diplomacy is called for…she's got your back. She's fearless, this one, not intimidated by larger Pegasi or predator — whether this is insanity or genius is in the eye of the beholder, but she's bright enough to keep herself out of trouble most times. Now, <i>you</i> she has no control over, and therein lies the problem. After all, she would move heaven, earth, and the stars for you in one fell swoop, so why not throw herself into danger to get you out? You'll never get a straight answer on that out of this one! Still, no matter what problems she might have with subtlety, you can count on this Dawnblush: she'll never let you down. Stout, compact, but undeniably feminine in the same breath — this Dawnblush mare is quite something to behold. With her daintily dished head and her constantly-pricked ears, you’d think she would be as delicate as her Moonfire sisters; but this isn’t so. Instead, she is short but thick, with a muscular form and short legs that allow for maximum agility. When at rest, she may never appear delicate, but there is something in her catlike stride that calls to femininity. It could be the way she almost seems to prowl, head low, the thump of her vividly orange-red hooves surprisingly soft for something so bulky. Or that could be the mystery of her coloring; black and white, she wears the little black dress of the Equine world, slimming her deceptively. While a frost of white ticks down her dainty face, accenting warm brown eyes, it billows to life in a stark blanket over the aft half of her body; from the midpoint of her back down her hindquarters, white reigns. Abstract spots of impish black refuse to be completely lost, though, across the blanket! The long, black-frosted-silver pinions that sprout from her shoulders are a mixture of maneuverability and stability in the air — a contrast to her agile body, to be sure, but a balancing one! If you weren’t clued in by the subtle stalk of this slinky gal, you might just be fooled by the innocence in her wide brown eyes. You might take her seeming airheaded grace to mean she’s just a normal ole’ Dawnblush, in for a good time and maybe some hot mash at the end of the day. Oh, would you be wrong! Sure, she may be an abiding companion most of the time, complacent and happy to go along with whatever you say — but make no mistake, she’s probably the smartest Pegasus in your herd! When she puts her foot down (and she will, seemingly at the strangest times), she will do so with aplomb, usually managing to drop you on your rump before she makes her choice as to whether to fight or flee. In this mare’s world, the answer is usually ‘fight’, which is pretty likely to get you in trouble, since she kicks like an elephant and breaks bones when she bites. At the same time, she only really digs in when the situation is serious, and she feels like her rider or herself are in danger, be it from the scary bug that’s crawling on the fence, or from a Hyard lurking in wait to tear her to bits. Hey, she might seem like she’s a stubborn heathen when she’s bucking and flailing out of the blue, all remnants of the sweet lady gone, but she has her reasons! It’s best to listen to her.